The high: Got an e-mail from our adoption facilitator that our young birth mom made it to the embassy and was firm in her commitment to adoption. Oh Lord, to parent this little boy we love so much! We were thrilled. High fived. Laughed out loud. The low: We received an e-mail from USCIS (the embassy) a few hours later. Our young mom wrote the name of a birth father. Up to this point she had been the only parent named – the father was unknown. Of course USCIS wants to interview this man. That interview is now scheduled for March 22nd. The truth (even though it’s hard): Dad deserves a voice. It’s so important that Laurentz’s dad knows what is going on and feels comfortable with this decision. He should also have the right to say no. Or yes. Or maybe. The frustration: We know truth and we honor it. But we’re just not a huge fan of our hearts beating out there all fragile and vulnerable for what seems like forever. But then again that’s what adoption is all about. And it’s not likely to change even after we get one, two or three of them home. 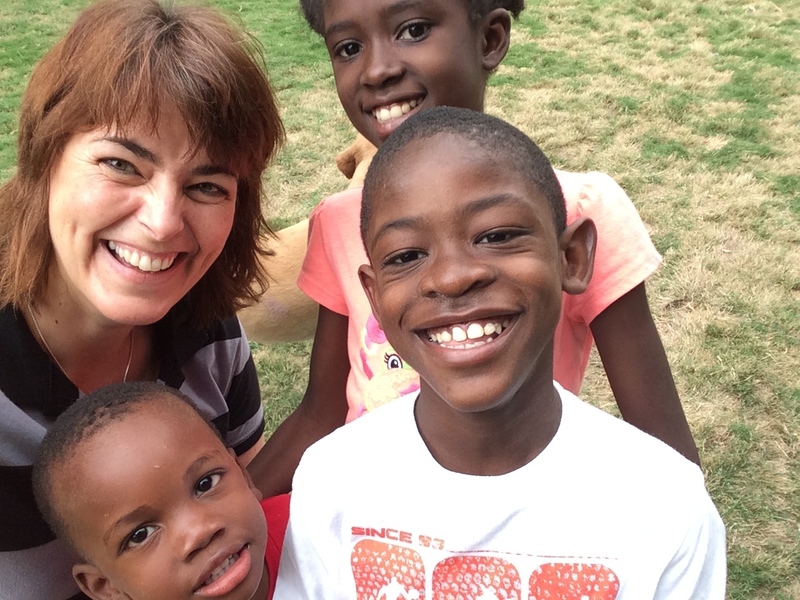 Ok, so Laurentz’s mom has made it to two appointments on the Haitian side of the adoption (Yay!). She has one more to attend – and this is a big one for the US side. This Wednesday she will go to the US Embassy. It’s a huge deal that they gave us another appointment (thank you, Lord! ), please pray that she makes it and that all goes according to God’s will. We would love to believe that WE are God’s will for our sweet Laurentz, but we hold fast to the truth that God knows a whole lot more than we do. Pray for God’s best for this little boy, whatever that may be! Also, will you please say a prayer for Brian? He will travel to Haiti late Wednesday evening, and arrive Thursday morning. He will stay until the following Tuesday. Pray for sweet moments of connection for he and the children, health and intimate moments with our God. Thank you friends! I will update you as soon as I hear anything about the appointment. I wasn’t going to tell you any of this. Somehow it didn’t seem right to put you through all the emotions… but then I reminded myself that you signed up to join us on this journey. Or you just clicked on this blog. Either way, it’s your own fault, really. I’m not sure exactly where to start, so I’ll just go through the images that play over and over in my mind. The first is the joyful snapshot of Wilna as I taught her to balance a broom on her foot, nose, and finger. She concentrated hard as I taught her the key to successful broom balancing: stare at the very tippy top of whatever you are balancing. I held him for a few minutes as Miriam shared that his birth mom had brought him for the visit. I knew right away I should say hello to her, thank her for such a sweet gift. I took Laurentz over to his friends whom he hadn’t seen for nearly a month. I set him down so he could play, but he wouldn’t let go of my hand. I swallowed the tears as I gathered him back up. “I’ll be right back,” I told him, snuggled him close and then gently set him down again. I walked with Miriam back toward the guest house. Normally you don’t get to meet the birth parents of your adopted child, but since the adoption wasn’t happening, I was allowed to greet her. I saw her at a distance and was amazed at the depth of love that flooded my heart. So young, so beautiful – and I can only imagine all she’s already been through in her life. I don’t blame her at all for the depth of our sorrow over Laurentz – we just all happen to love the same boy. Again I hugged her and then asked her to wait just a moment while I ran upstairs. I had brought some clothes we had gathered for Laurentz, along with a few toys. It seemed right that he should have them. I brought them down and we looked through them together. She nodded. She knew that. I was stunned. Her change of heart was completely unexpected. I had to tell Brian. Quickly I walked to the toddler area. “Mama Laurentz! Mama Laurentz!” The children yelled. Oh yes, it’s me! Mama Laurentz! I held out my arms to Laurentz and we walked back to the guesthouse. As soon as I got within internet range, I tried to call Brian. Nothing. More nothing. In fact, for the rest of the trip, we had no internet. Thankfully, Miriam came with our young birth mom, and Miriam had her phone. Together we called Brian. This young mom got to hear the shock, the joy, the delight in his voice. Such a profound gift and privilege. I want us to stay connected, we all want her to see and know her beautiful boy and for him to know her. Somehow we will find a way. For now, we are grateful – overwhelmed, touched to our very core. On our last day of the trip, I was able to connect with our adoption facilitator. He assured me that he could catch Laurentz up quickly – as long as his mama signs some papers and we can get another interview on the US side. Last time was supposed to be our last chance. Can we still make it happen? This is where we need your prayers. 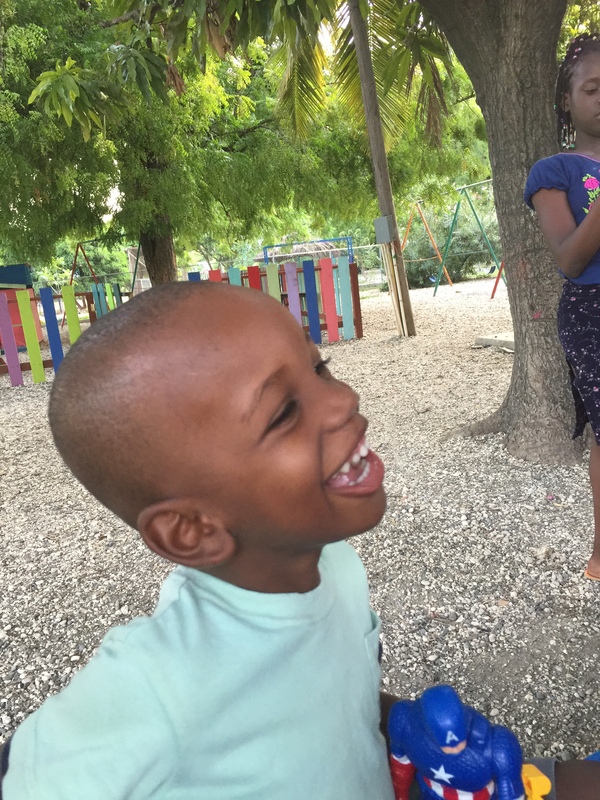 That if this is truly what God has, and what this young mom feels is best for Laurentz, that she would feel courageous in signing papers on the Haitian side. That is supposed to happen tomorrow. Pray also that we are able to get another appointment with the government for her to meet with US officials – and that she will have the courage/strength/heart to attend the meeting. You know, I remember a few months back I traveled to see family – it was just when we were learning that Laurentz’s mom was not going to let us adopt him. I stood inside the airport tram and watched a tall, lean dark skinned man jump on board just as the doors were closing. I smiled at him and then noticed his name tag. “Laurenze.” I wondered then if God was somehow letting me know that things would change – that at the very last minute before the doors closed, Laurentz would slip into our arms. I held that snapshot in my mind, and it came to my thoughts today. Could it be? Oh friends, I wasn’t going to say a word until his mama attended the next steps – tomorrow and on the US side – because what if she doesn’t? Or something else happens? I hate to run you through the emotions as well. Then I realized that I’m not being fair. You signed up for the ride, so we’re taking you with us – even if the new highs lead to new depths. And we covet your prayers. Please pray that everything will come together for this beautiful young woman and her precious boy. What a privilege to come alongside her to raise him. Adding joy to our awe, the last snapshot. Our adoption guy brought copies of the adoption decrees for Lovence and Wilna. The real thing. Officially official. They are now Lovence and Wilna Colopy. They are, as they have already been in our hearts, officially our children. He also said we should have them all home by April or May – Lord willing. Oh Lord, thank you! Bring all three of our babies home! We love them so and we love you for placing us on this journey. We couldn’t do it without you and we wouldn’t want to… make us more than what we are today so we can love these children the way they deserve – for always. I leave this morning for another trip. Of course it wasn’t until after I scheduled it that I found out there are elections going on. Not to worry, says the US, except for the days leading up to the election and the days immediately after. Then you have to watch out for road blocks, burning tires in the streets, out-of-control protests. All that to say, please pray. I head out in an hour and will meet up with my niece, Mallory, in Miami. We will spend the night there and land into Haiti tomorrow. The election is planned for Sunday and we leave again on Tuesday (Hmmm, would that constitute a few days leading up to and a few after the election?). Please pray for a safe arrival to the orphanage and that we will be able to leave when it’s time to head to the airport on Tuesday. Pray also that God would protect us while we spend time with the children and that all the staff, children and visitors would be safe within the confines of New Life. So I was going to write a nice long update blog, but now I have to jump in the shower and head to the airport. So let me get right to the point. Will you please pray for these things, starting ummmm, now? Safe travels to and from the orphanage, and while we are there. Wonderful moments with Wilna and Lovence, that they would know how much they are loved – that they are family. Pray for our bond to grow deeply and sweetly in this visit. Comforting moments as my heart aches for Laurentz. I will go to the toddler room to hear the little ones say, “Mama Laurentz!” only no Laurentz will be there. Thank you, dear ones! I will update you when I return! We love this little boy. Laurentz was 15 months old when we met him. Late on that first evening, I held him in my arms and he fell asleep. Sitting for a good while in devotions with the kids, he became sweaty against my shoulder. I adjusted him to lay on my lap, his head by my knees, his little feet resting on my belly. His arms fell to the sides – outstretched. I laid my hand on his chest and I prayed for him. I prayed that God would protect him, that he would plant a love for him in his heart from an early age. I prayed he would become a man of God with a heart for people. I prayed that God would watch over him all of his days – and that should it be in his plan, that we would get to love him as our son. It was an intense moment. It stays with me still, nearly 39 months later. We began the process to adopt Laurentz. His birth mom was unable to care for him and had signed papers releasing him. We submitted our dossier and the journey began. 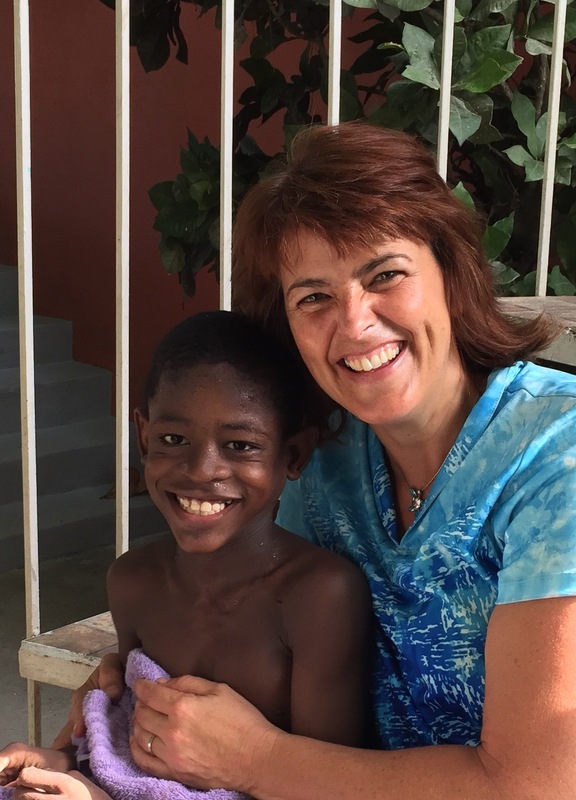 Last week, in an unexpected turn of events, Laurentz’s birth mom came for him and took him from the orphanage. She gathered his belongings. She left, little Laurentz in tow. In a perfect world, we would celebrate. What better thing than for a mom and son to be reunited, for our boy to be raised by his birth family and to live in his home country? Family restored. Life renewed. Hope again. I want the very best for Laurentz. And yet I fight worry for him. I’m sometimes overwhelmed with the sadness. In my brain, we would either love him here or love him there. It never occurred to me that we might never get to see him again. And that’s a distinct possibility. In two days we have our final birth parent interview. If his mom doesn’t come, the US will officially deny the adoption. At this point, it’s looking like we will not get to bring our little boy home. But still we pray. We are taking these few days leading up to the interview to pray intensely for his life. We don’t want to lose him, but we trust God. He knows Laurentz, He loves him. He knows his mom. He knows what is best and He knows the plans He has for that beautiful little life. We love him too. We want him to grow into the man God created him to be. We want him to be safe, loved, delighted in… We want his future to unfold with great adventures on the horizon and deep wells of love to tap into as he pursues them. He has the best smile and we want him to smile a lot… even if we never get to see it. It would be arrogant of me to assume we are the best parents for Laurentz, so yes, while we love him like crazy, we do trust that God may have other plans. Of course that doesn’t make the potential loss any less. 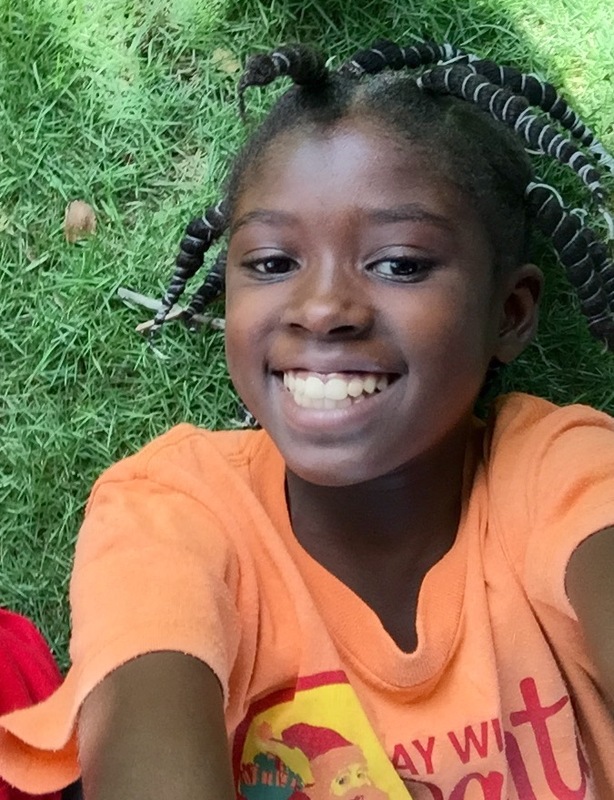 Will you please pray for Laurentz? Pray for his mama. Pray for his family there. Pray for his best to unfold and for us to celebrate God’s goodness in the midst of our own emotions. Laurentz is a sweet, sweet boy who deserves big love and a bright future. And should it be that his future is with us, pray his mama comes to the interview and gives us the chance to raise him. If not, may God strengthen her to be a wonderful mama who kisses his cheeks and wipes his tears and equips him to live a full, beautiful, glorious life. Oh God, please bring your best to Laurentz …. wherever and with whomever that may be. You are good and we hold on to you, even when the emotions flood our hearts and seep out of our eyes. Watch over Laurentz – for all the days he has on this earth, my God. He is a beautiful boy and we love him. Three years ago we started the process to adopt Lovence and Laurentz. Then God brought Savannah into our lives, then Wilna. Now we are fighting to bring all four together under the same roof. Savannah asks for them regularly. “My brothers and sister,” she says and points to their smiling faces framed on our kitchen counter. And it’s slowly happening. As you last heard, we had to fire our previous adoption facilitator. I’ve since been to Haiti and filed the i600 – this is a document that would classify the children as our immediate relatives so that we can get them home. That won’t happen until the Haitian side of the paperwork is complete, but that’s coming together. We HAVE received the authorization for adoption from social services there, and we HAVE hired an official placing agency to help us finalize all the paperwork. Unfortunately, while we’ve been fighting for them, Laurentz turned 4, Lovence turned 8 and Wilna turns 11 in just 12 days. They are growing up too far away from their home and family. Brian will travel today, landing in Haiti tomorrow morning. He couldn’t be with Wilna on her actual birthday, but it will be close. He even has gifts wrapped in the suitcase – probably the first wrapped gifts she’s ever received. He’ll be with them until September 9th. We will try to travel there every other month until we can bring them home. We want them to know that they know we will always come back. September 8th is another big day. The birth parents will have to bring our children to the US Embassy in Haiti. They’ll be interviewed with the kids to verify that all that’s happening is according to their wishes. I can’t imagine what that will feel like for our children – particularly Wilna who is old enough to understand. I can’t imagine what it will feel like to the parents as they stand before the Embassy officials. Oh Lord, will you be with these parents? May your will be done for them, for their children, for our family. Keep Brian safe and watch over his visit. May his time with the children be sweet, wonderful, delightful to their hearts. PS. I would love to give you a time frame for when we’ll finally bring them home, but it’s always so hard to say. We hope it will be springtime… Lord willing. Earlier today I sent out a 911 prayer request, asking that God would open a door to allow Wilna’s birth parents to be interviewed. Your prayers truly made a difference. Within an hour of requesting your prayer, the parents were ushered in to meet with the officials. It brings tears to my eyes just imagining that conversation regarding any of my children. So no, we want these birth parents to know about their children, we want to honor them and keep them up to date on their lives as much as we’re able. But of course the officials stress those things because in some cases that’s what happens. Children are adopted and are never heard from again. We don’t know for sure what unfolded in that interview, but we do know that a decision was not made. The officials simply didn’t feel confident about it. The parents will head home to the mountains and must return on March 10th to be interviewed again. If there is any uncertainty at that meeting, we will no longer be able to adopt Wilna and Lovence. And honestly, as much as that breaks our hearts, that is as it should be. Birth parents matter. Their hearts matter. These children, as much as we feel like they’re ours, are not ours. They belong to a couple who live in the mountains who are unable to care for them, and in particular cannot care for Lovence and his special needs. We would be honored to add Wilna and Lovence to our family, to love them as our own and raise them to adults, but that’s not our decision to make. Oh my friends, will you pray with us that God’s will would be done in the lives of these children? That when these parents come back for the second interview, that they would feel God’s presence, comfort and direction? Pray also that they would not heed any lies. Sometimes witch doctors will tell them that people want to take their children to do horrible things to them… voodoo is big in Haiti and that can play a role as well in the decisions people make. It’s been an emotional day. My man flew all night and arrived to these realities. He will still try to meet with the director on Monday – we are not sure what it will accomplish, but we want to keep our file front and center so we can move on to the next step. If everything were to come together in the way we hope, we could have our children by Christmas. If not, we will spend another Christmas loving them in Haiti. Either way, God set them on our heart and we will love them always – no matter what, no matter where.